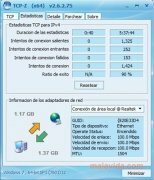 The latest versions of Windows, specially Windows 7, come with the limitation of not accepting more than 10 incomplete outbound TCP/IP connections. 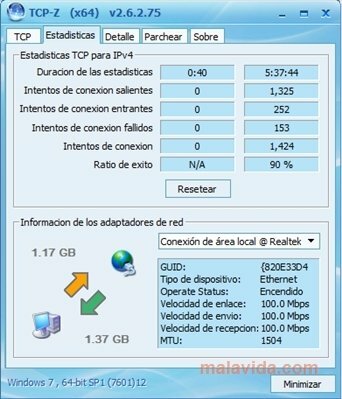 This kind of connection is basic for P2P programs, and their amputation can considerably affect their performance. The best solution to this problem is provided by TCP-Z, a simple tool with which we will be able to increase the number of half open connections and supervise the effectiveness of any change though its interface that is suitable for more or less anyone. Through its window we will be able to view the number of established connections, the limited connections and the real upload and download speed. In the Patch tab we'll have two options to choose from: to perform the changes directly to the kernel memory, that will be applied instantly but will be lost whenever we restart the computer; or patch the Tcpip file, that will require that we reboot the computer to apply a set of changes that will be maintained until we decide to modify them. TCP-Z is one of the few similar utilities that offer the option to directly affect the kernel memory. This option, that instantly performs the changes, even though they are only temporal, is the best option for inexperienced users that may be worried about messing up the Windows Registry file. The quickest and easiest way of avoiding the absurd limitation that is detrimental to P2P downloads.